Chronic Illness and "Spoon Theory"
In honor of all the chronic illnesses that we raise awareness for in the month of May, let's address the question: What is a spoonie? Today’s awareness blog topic was chosen after we received a few emails asking us about our “Spoonie” pin, featured of our home page. If you’re active in the online chronic illness groups on social media, I’m sure you’ve noticed the hashtag “#spoonie” used pretty often in reference to chronic illness. I know that when I first got involved with Personalized Cause, I was unfamiliar with the term and seemed to see it pop up everywhere like some kind of inside joke everyone was in on besides me. But, after doing a lot of digging on the interwebs, I was able to find the original article that the hashtag was born from. So, today, I’m going to explain Spoon Theory to you guys, so that we are all in on the joke. That way all my chronic illness people out there can start using is with reckless abandon, without having to guess if they are using it correctly. First, let’s talk a little bit about chronic illness, since understanding chronic illness is key for understanding Spoon Theory. So, what exactly qualifies as a chronic illness? Excellent question! There are a lot of misconceptions about what defines someone’s health struggle as a chronic illness. I’ve heard people say that an illness is only considered a chronic illness if you become disabled from it. That could not be farther from the truth. I’ve heard people dismiss symptoms of chronic illness and blame their inability to do something on being lazy because “they look fine.” This is a common stigma people with chronic illness face. Often times, people who don’t understand what it’s like to deal with a lifelong health struggle can be dismissive, belittling, and trivializing. People who suffer from chronic illness deal with sometimes debilitating fatigue. It is physically draining for your body to constantly be fighting to maintain and function. It costs way more energy for someone with a chronic illness to complete daily tasks than a healthy person when their disease is active. Unfortunately, people who don’t have a chronic illness themselves don’t always understand this. As the saying goes, “people don’t get it, until they get it,” meaning that the only way for someone to understand what it’s like to have a chronic illness is for them to experience it themselves. A chronic illness is defined as a disease that is ongoing for over three months. The reality of the situation is that most chronic illnesses last a lot longer than just a few months. Most chronic illnesses are lifelong struggles, or may come and go in episodes, or flare-ups. Because it can be discouraging, upsetting and exhausting to deal with a chronic illness, one of the most commonly experienced complications is depression. A huge percentage of those suffering from a chronic illness also struggle with chronic depression due to the stress and anxiety, or even anger caused by a health issue. It is important to treat the depression on it’s own, and not just hope that by treating the chronic illness, the depression will be treated as well. People can continue to struggle with the depression brought on by chronic illness even after they are feeling better. Some examples of chronic illnesses are things like cancer, asthma, autoimmune diseases, diabetes, HIV/AIDS, COPD, hepatitis, etc. The list goes on and on. Chronic illnesses usually cannot be cured (with some exceptions), but can be managed with appropriate treatments and lifestyle changes. Sometimes people experience long periods without disease activity, and some people are never completely symptom free. Each chronic illness is very unique in how it affects the person who has it. Chronic illness can be extremely overwhelming, and may make some people unable to work, or even care for themselves. People often make the mistake that people who have a chronic illness but look healthy are fine. Looking healthy and being healthy do not necessarily come as a package deal. The former can certainly occur without the latter. Just remember that you don’t know what it took for that person to appear healthy. They may have spent hours trying to achieve that, whereas others can just wake up looking that way. People who have chronic illnesses can experience chronic fatigue, chronic pain, disability, insomnia, and more, which all drain their energy. Now that we all understand a little more about chronic illness, I think we can get to Spoon Theory. I’ll include the link to the original article by Christine Miserandino at the bottom of this post. The article starts out by setting the scene. The author describes the moments leading up to the origination of the spoon theory. She was a normal college girl, with her roommate, eating fries at a diner and chatting about this and that when suddenly her roommate asked her what it felt like to have lupus. Her roommate had watched her live with the disease for quite some time, and so she had assumed that she understood the ins and outs of the disease. But that wasn’t exactly what she meant. She wasn’t curious about what lupus was and the symptoms it caused, rather, she was asking what it felt like to be Christine- a person battling a chronic illness. People with chronic illnesses get this question a lot. It’s very difficult to put into words what it feels like to be sick. It’s even difficult to find the words in your own mind. Nothing quite describes it, and you’re left with an answer that’s as close as you could come. When I was younger, I used to try to practice explaining what chronic illness felt like, so that when my friends asked I could answer them accurately. I was never able to formulate a sentence that really embodied the experience. And so, like Catherine, I would try to invent metaphors for it. Catherine’s metaphor of living with chronic illness was inspired by her surroundings at that diner; she grabbed as many spoons as she could from the surrounding tables and handed them all to her roommate, proclaiming, “Here you go, you have lupus.” The difference between a healthy person and a person living with chronic illness is represented by this spoon metaphor. 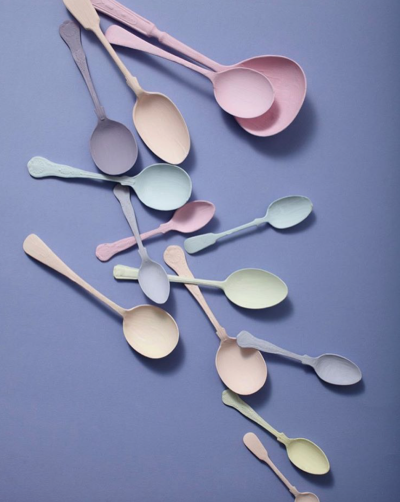 Healthy people have a limitless supply of spoons; someone suffering from a chronic illness has a finite supply. When you have a disease like lupus, everything you do must be deliberate. You have to be meticulous with the way you do things, in order to get through the day. You have to choose what to spend your energy on in order to get through as many things as you can. The spoons represent the energy required to perform a task. Say you have 12 spoons of energy, and you have a normal day of college ahead of you. How do you spend those 12 spoons in order to make it to school; Keep in mind, everything costs something. What do you forfeit? Getting out of bed, that’s one spoon. Taking a shower, that’s another spoon, if not two. Getting dressed, another spoon. Brushing your teeth, spoon. Putting on makeup, spoon. Making breakfast, spoon. It adds up so much quicker than you think. It all came down to this one last task for the day: dinner. If she made dinner herself, there wouldn’t be enough spoons for her to clean up, and if she went to pick something up, she may not have enough spoons to drive home. This little example is actually a very accurate dilemma for someone with a chronic illness. So, what do you do? You grab something out of the fridge, and heat it up. That’s all you can afford with your remaining spoons. From day to day, the number of spoons you start out with may go up a little or down a little, but it’s relatively constant. The takeaway of spoon theory is this: you cannot do everything you want to do; you have to choose, everyday, what to spend your spoons on. The people who face this daily struggle have adopted the term “spoonie” as a nickname for chronic illness sufferers. I highly recommend you check out the original article. It’s a quick read, and Christine does a wonderful job of conveying the frustration people with chronic illness feel. I hope that helped to quickly explain Spoon Theory in a way that’s easy for people without chronic illness to understand. And with that, I’ll wrap it up. If you’re a new reader, please read the last paragraph, or so, so that I can explain who we are and why we’ve started this awareness blog. Veteran readers, catch you next time, I hope you enjoyed today’s post. Personalized Cause is an awareness accessory company based in California. We specialize in custom awareness ribbons. We are the only company that offers customers the option to personalize any color awareness ribbon they choose. Custom awareness ribbons can be personalized with a name, date, phrase, or message. Our custom awareness ribbons are engraved on cloisonné awareness ribbon pins. They are a beautiful way to support a loved one, or advocate for a cause. If custom awareness ribbons aren’t your thing, we also carry classic awareness ribbons, fabric awareness ribbons and silicone awareness wristbands. We started this awareness blog because we believe in the power of awareness. We believe that educating people can save lives, and that prevention is the most important way to protect your health. We also know that not everything can be prevented, and we want to help inform our readers about warning signs and symptoms of lots of different illnesses, so that they can recognize a problem early on. Early detection is so important to having the best possible outcome. So, if you’re interested in learning a little something every week, and becoming a more aware human, check out our weekly blog.